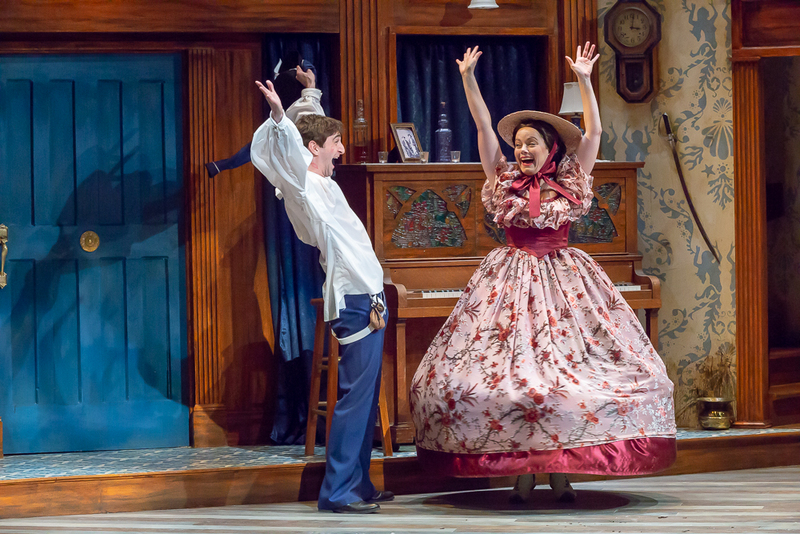 Abby Lee as Olivia and Patrick Earl Phillips as Sebastian in Cincinnati Shakespeare Company’s 2018 production of Twelfth Night, directed by Austin Tichenor. By Mikki Schaffner Photography. Centered around characters who improvise wildly after experiencing great personal loss. These thoughts came to mind because I’m directing Twelfth Night for Cincinnati Shakespeare Company (which opens this week), and I discovered that, despite its much-deserved popularity, it’s a big play to get your head around — particularly if, like me, you’ve only ever seen productions of it and never actually worked on it yourself, and only studied the script long enough to plunder parts of it for re-purpose in William Shakespeare’s Long Lost First Play (abridged). My initial observation that, “My God, this play’s as massive as Hamlet,” was originally a glib joke, but the more I began to think about it, the more I realized that, like all the best jokes, there was some truth underneath. Twelfth Night’s famous first line (you may know it: “If music be the food of love, play on.”) tells us exactly what this wonderful comedy is about — Music and Love — and many productions focus on only that. But its first scene tells us that we’re also dealing with great Loss and Separation. We discover our heroine Viola has survived a shipwreck in which she thinks her brother has perished, and that the Countess Olivia is also mourning the deaths of both her brother and her father. Our two heroines are sisters in loss, and treating that loss with the weight and seriousness it deserves gives their shared emotional life a richer texture — even while Olivia falls farcically in love with Viola disguised as a man. 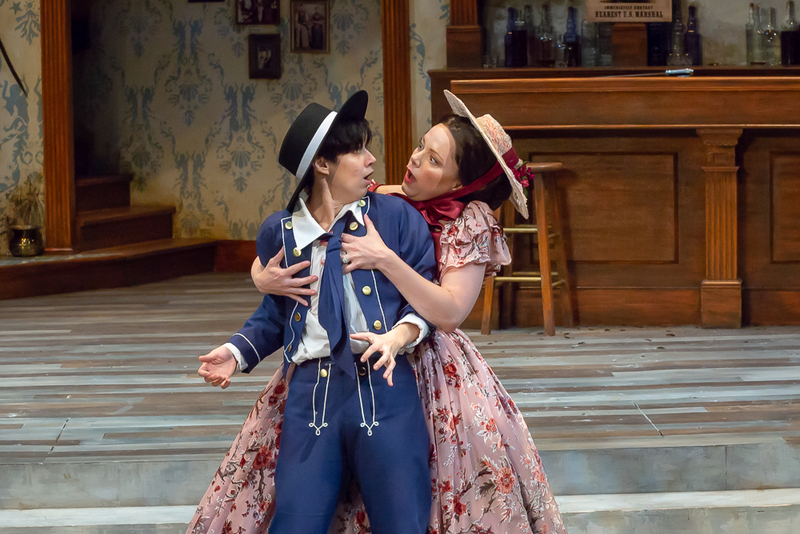 Abby Lee as Olivia and Caitlin McWethy as Viola in Cincinnati Shakespeare Company’s 2018 production of Twelfth Night, directed by Austin Tichenor. By Mikki Schaffner Photography. Hamlet, of course, is also about great loss, but in the form of murders both seen and unseen that leaves a pile of corpses onstage. While Twelfth Night, thankfully, leaves a pile of happily married couples onstage, I was thrilled to (re)discover that Twelfth Night and Hamlet were quite possibly written at roughly the same time, somewhere near the turn of the 17th century (1600). It’s not clear which play was written first, nor is it fruitful to see any work of art as strictly autobiographical, but it’s interesting to note that Shakespeare’s son Hamnet had died not many years before, in 1596 — and was survived by a twin sister. Grief is clearly at the heart of both plays: In Hamlet, grief is mocked and leads to suicidal thoughts and revenge; in Twelfth Night, grief is shared and leads to happy resolutions in which survivors find love and go on living. And in both plays, the grief must be treated as absolutely real. For my money, it’s this very powerful grief that makes Twelfth Night’s comedy and romance soar. Like the best jokes grounded in truth, the greatest comedies are fueled by the most desperate of situations. Viola’s need to survive is what spurs her to decide, more or less spontaneously, to serve in Duke Orsino’s court. But it’s her desire to honor her brother, to keep him alive, in a fashion, that partly inspires her to dress as a man. Hamlet sees the ghost of his father in Elsinore castle; Viola sees the ghost of her brother in the mirror when she dresses like him. 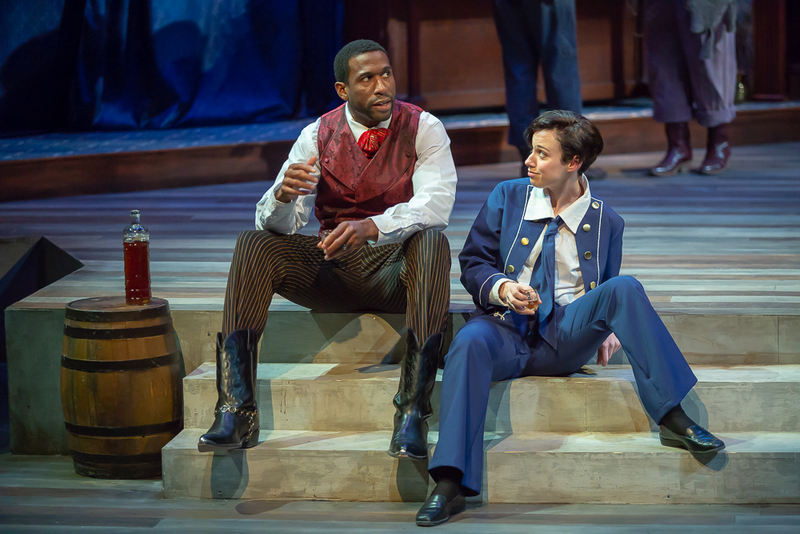 William Oliver Watkins as Orsino and Caitlin McWethy as Viola in Cincinnati Shakespeare Company’s 2018 production of Twelfth Night, directed by Austin Tichenor. By Mikki Schaffner Photography. Olivia is similarly haunted by the deaths of her father and brother, and abandoned to the care — and burden — of a drunk uncle and officious steward, neither of whom are able to put off Orsino’s very persistent servant “Cesario.” Olivia is forced to confront this messenger herself (it’s actually Viola in disguise) and discovers the “fair young man” possesses a sincerity and soulfulness that’s different from all the other men in her life. Olivia is almost instantly smitten, perhaps because she also unconsciously senses in “Cesario” the shared sisterly bond of being abandoned in this strange land. 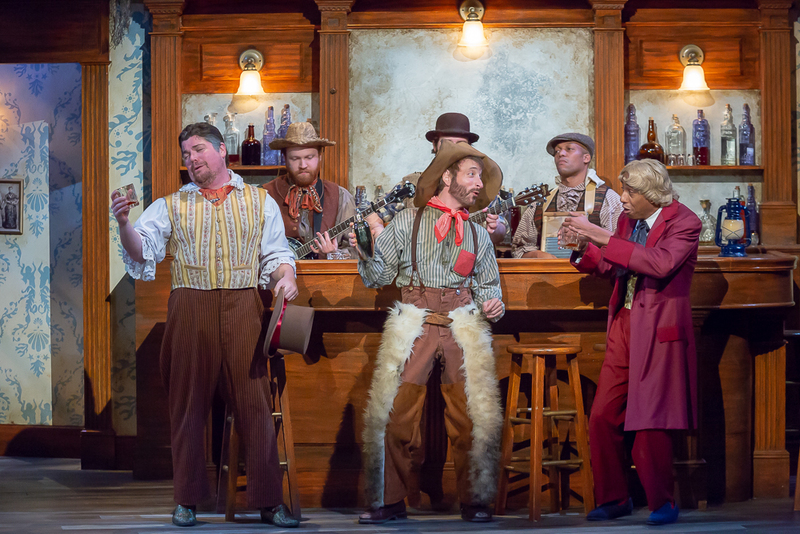 (Front row, from left) Billy Chace as Sir Toby Belch, Paul Riopelle as Feste, Geoffrey Warren Barnes II as Sir Andrew and cast of Cincinnati Shakespeare Company’s 2018 production of Twelfth Night, directed by Austin Tichenor. By Mikki Schaffner Photography. There are interpretations of Twelfth Night that can emphasize the gender-bending sexual attraction caused by a woman dressed as a man, or focus on Viola as a representative of the “Other,” and how her presence changes a community for the better, but I’m choosing to focus on the desperate situations Shakespeare establishes in his first scene — and staying aware that one can definitely overthink this. Twelfth Night is neither an academic treatise on grief nor a factual documentary about 1850s San Francisco; as the Captain tells Viola, “This is Illyria, lady” — a highly theatrical (and at times deliberately anachronistic) comedy in which the setting gives helpful context and specificity to the idea that it’s possible to hit romantic pay dirt even after the greatest of loss or on the wildest of frontiers. While there are still other similarities between the two plays (intercepted correspondence, returned love tokens, clowns who joke about death, pirates!) Twelfth Night has one thing, thankfully, not in common with Hamlet — it’s not four hours long. (Hamlet is Shakespeare’s longest play at 30,557 words; at “only” 19,837 words, Twelfth Night is his ninth shortest.) But despite their relative brevity, all of Shakespeare’s comedies — including Twelfth Night — should be approached and acted with the same seriousness of purpose as you’d tackle Hamlet or any of Shakespeare’s tragedies. Maybe even more. Miranda McGee, who also plays Antonia, Jeremy Dubin as Fabian, and director Austin Tichenor at the onstage saloon. Cincinnati Shakespeare Company’s 2018 production of Twelfth Night. By Mikki Schaffner Photography. Cincinnati Shakespeare Company is one of the Folger Shakespeare Library’s theater partners. 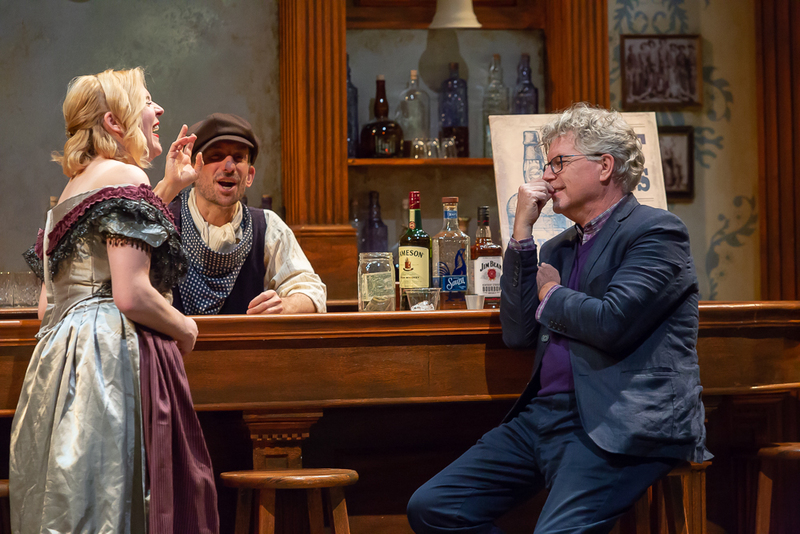 Explore what’s onstage at several Folger theater partners this month—including the Cincinnati Shakespeare Company—in our post, What’s onstage at Shakespeare theaters in November.